Santorini is a beautiful but very busy island. Kalestesia suites, at the end of the caldeira is a wonderfully quiet place to relax in a beautiful environment. Breathakings views from the hotel, simple but very tastefully decorated room, small and friendly team. 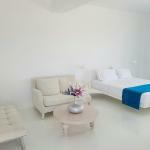 With 10 rooms, it is definitely a boutique hotel. Being in a isolated part of the island, having your own transportation is needed. We can't recommend this place highly enough. Everything was perfect and the service was excellent and authentic- we really felt like Sam and the rest of the staff cared that we were enjoying ourselves. This is a magic place in the world and this hotel rounds off a brilliant experience. Me and my friend came by this hotel by chance. 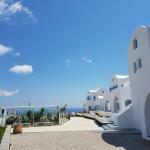 We stayed at a perissa inn for a day as a part of our vacation package. We were disappointed with our other hotel,thus we booked a suite through the internet for Kalestesia suites for 3 days. 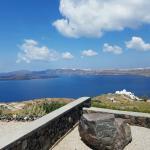 We took a cab from fira, at first we were thinking that the hotel was a little harder to drive due to its location on top of hill but then lo and behold the view that we saw in kalestesia. We stayed at the top of the first suite. The suites are just the right size, improvement for the shower stall is needed as water would flood the bathroom floor everytime you shower. All in all it wasn't a big deal. The service was impeccable, samson and the rest of the staff would take good care of you from day 1 to the day you leave,just for that i gave them 5 stars!! they will go out of their way to see to it that your stay will be stress free and relaxing. If you want time to relax, away from the loudness and craziness of fira or oia this is your sanctuary. We stayed 1 week at Kalestesia Suites , Samsun and all the staff were so kind so helpull , They make everything for having an inforgettable vacation . Santorini is small so we like to have hôtel on the top of the mountain . The bed is good for sleeping , the maid clean and change the towell everyday . The breakfast was very very good and it changed all the Time . The hotel can bring rental car for you . We had champagne for welcoming , we Just spend a very peacefull and good week there . Hope to back again ! We have spent 4 nights in Kalestesia. Everything was perfect. 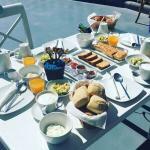 Breakfast on the terrace of the restaurant with view on the sea. All our requests were treated very fast. The staff is very kind and smiling. The whole place is very quiet, and we've slept better than in our own beds in France. Possibility to have lunch on our own terrace. It was our 2nd stay in this hotel. I hope we'll be able to come back another year.